Thousands of antifascists and atniracist protesters sent a strong message from the center of London on 22nd March. The antifascist struggle does not stop here. We continue every day, in every working or education place to fight against the fascism of the employers, of the state of the EU, against any fascist group! Adonis Georgiadis is the unique so far success story of the Samaras-Venizelos government: he is the proof that under the right circumstances, any second grade far right-wing, unscientific nonsense book merchant can become a minister and grab anyone who disagrees with him from the neck. We were not surprised by the conduct of the Minister of Health in his speech at the Imperial College when he attacked people in the audience. Neither by the organizer of the event, the far right-winger and junta fan, member of ONNED who in his speech praised the neo-Nazi Golden Dawn as a “counterweight to left-wing ideology”. And to prevent further surprises, we’d like to inform that all the previous years, ONNED and DAP were (and still are) “shelters” for far right-wingers and neo-fascists in universities. Now that the minister has been completely unmasked, revealing the extreme far right-wing thug he did not hide, with him were exposed all the incredible scribes of the “democratic centre”’ and “responsibility” which painted his profile as decisive and “hard-working “. The “hard worker” went to London at the expense of the Greek people as a favour to the junta supporter son of a former hospital administrator. Merciless coincidences, right? Your decisive hard-workers have destroyed public health. Go for a walk to hospitals and emergencies to see what the closure of EOPYY has caused. Observe a shift to see how the doctors you easily blame as lazy, work in public hospitals. The masks have fallen. The far right-wing government with the “responsible” facet neither wants to, nor can hide. Its’ days are numbered though. It is now the urgent obligation of workers to overthrow and sweep aside their oppressors: the capital, the EU and the IMF. It is our duty to overthrow the government of the Memorandum and its’ policies. NEITHER IN LONDON NOR ANYWHERE! 22nd March: The day we continue the antifascist struggle! On 22nd March we continue the antifascist struggle! In the conjuncture of economic crisis we are witnessing the aggressive growth of fascist groups and the intensification of the anti-migrant populist rhetoria of the governments in Europe. Especially in Greece, the Nazis of the Golden Dawn Party have murdered Pavlos Fyssas and have been attacking immigrants, political opponents and striking workers taking advantage of the fact that they are in the parliament. The Golden Dawn is the long arm of capital and therefore serve all the anti-social policies have been imposed. In turn, the Greek State has been extending a hand of cooperation to the Neo-Nazi assault squads of Golden Dawn, organizing racist pogroms in the neighbourhoods with stabbings of immigrants, destruction of shops and house intrusions whereas police has been attacking strikes and demonstrations with tons of chemicals. The Greek coalition government’s racist and fascist policies (directed by the E.U.) of concentration camps and of the denial of citizenship to the children of immigrants are not a different story. Instead, they are a compact package alongside with the draconian austerity and the barbaric measures that send hundreds of thousands to unemployment in the Periphery of the EU and not only. The xenophobic rhetoria is the centerpiece of the populist politics in the UK nowadays, too. The new regulations that were established on 1st January have been exploited by the extreme right wing parties, like UKIP and BNP, which targeted the Romanian and Bulgarian people. Additionally, the fascist group of EDL has tried to violently oppose the immigrants. Finally, the Torries and the government coalition continued their anti-immigrants propaganda making efforts to exploit this development, too. Therefore, they decided to restrain the benefits access of EU migrants. No matter how much effort the Coalition makes to persuade the British people in regard to immigrants’ benefits as the source of their poverty, this is far from reality. The truth is that since the very past, immigration has been a beneficial factor for the UK economy and culture as well. All these have been taking place in the political background and the debate about the relationship between the EU and the British State. The xenophobic, nationalist, fascist rhetoria accompanies the authoritarian façade of the European governments and the policies of the EU. All these reveal the real role of the State and the EU. The European States, hand-on-hand with the EU, have been applying racist and fascist policies. Policies that kill and destroy the societies (memoranda and austerity), policies that target the refugees (Dublin II treaty), new institutions that close the European borders (FRONTEX) and policies that exclude the immigrants from the welfare state (whatever has remained in the context of the bloody policies of the last four years. Recently, in Ukraine, with the support of the EU and the US, fascists have claimed key roles in the newly formed provisional government some of whose first acts were to ban the Ukrainian Communist Party and to abolish laws which criminalized Nazi propaganda and permitted the use of a second language in regions where national minorities comprise more than 10% of the population. All these prove that the EU not only does not guarantee democracy in Europe, but spearheads its undermining. We oppose all these murderous and fascist policies. Capitalism breeds fascism. Therefore, the enemies are not the migrants, but instead racism, fascism and therefore capitalism that bears these phenomena and imposes oppressive measures and policies to both migrants and local people. Moreover, we believe that the struggle against fascism and racism should be inseparable to the struggles against the E.U. as an anti-social capitalist formation. Finally, we state that we will continue fighting for an equal society without discriminations according to class, race and gender. ANTARSYA-UK actively supports the actions inscribed in the international day against fascism and racism. We call workers, youth, unemployed, immigrants and pensioners to participate and raise their voices on this day, to continue and deepen the everyday antifascist-antiracist struggle in every working place, in every neighborhood, in every street. 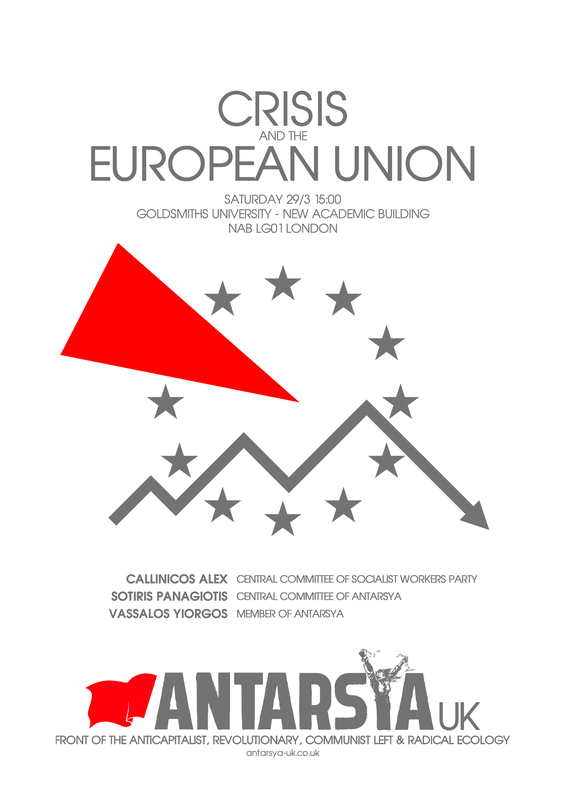 On 22nd of March we will give an international message against fascism, racism, the barbaric capitalist system and the E.U as its authoritarian guarantor in the European realm. 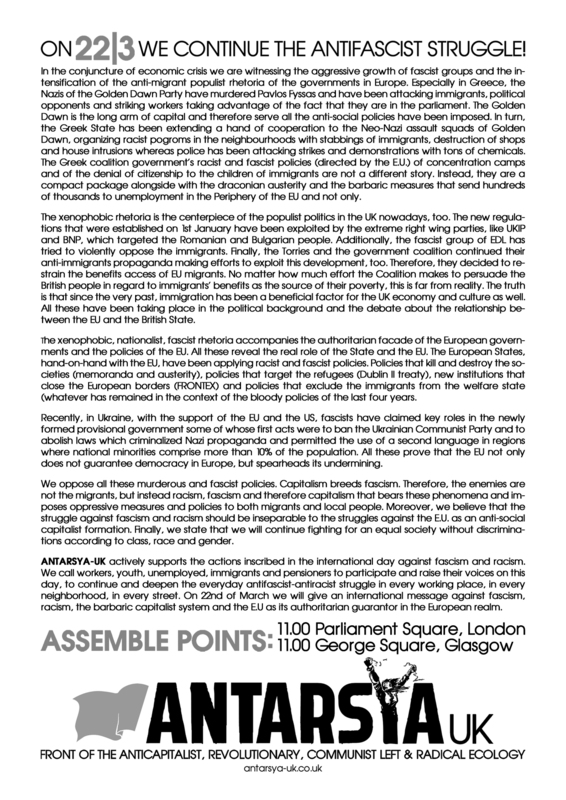 Assemble Points: 11.00 Parliament Square, London. 11.00 George Square, Glasgow. 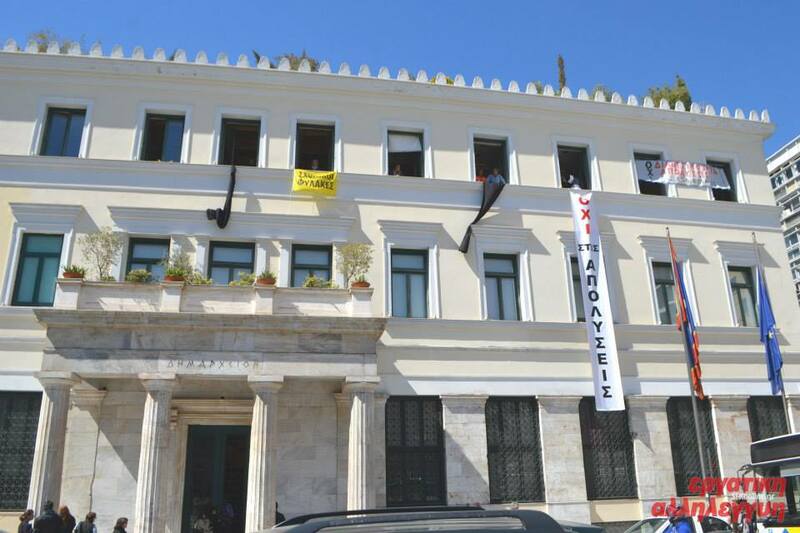 Announcement of the occupied City Hall of Athens. Today, the cleaners of the Ministry of Finance, the school security guards and the teachers of secondary education found themselves in the City Hall of Athens. We are some of the workers whom the government, the EU and the IMF are throwing into unemployment . For us there is no tomorrow if we do not fight. And there is no victory unless we fight together . Workers, the unemployed, the redundant, and the five-month contractors and the vouchers of slavery. Today from the Athens City Hall we are shouting that we fight for all workers. We declare that we will not leave from here, because what awaits us is poverty and destitution. We urge civil servants to come down today to the Kotzia Square and from tomorrow to strike. 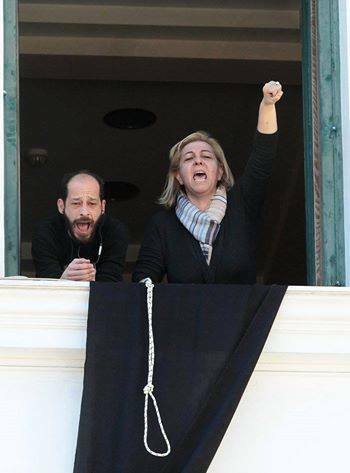 We call on the people of Athens to support us and fight with us. To rally to the Kotzia square and determined to give battle to overturn their policies. To remember that we experienced our greatest victories in the streets and squares, in the collective fight, in the subversive and intractable struggles. We fight so that our life is ours. Happening now: Solidarity with the struggle of the workers who occupied the town hall of Athens. “Under redundancy” workers of the municipality of Athens have occupied the town hall of Athens in response to the sacking and destruction reserved for them in a few days by the miserable PASOK-ND coalition government, which once again hastened to send the riot police to confront their struggle! Solidarity with the struggle of the “under surveillance” workers. Let us support the mobilization at Athens town hall. No redundancies. Down with the junta of the government, the EU and the IMF.